There’s no denying the fact that some of the best reward cards in Canada are offered by American Express and one or more of them should be in everyone’s wallets. While American Express may be a smaller player in Canada compared to other credit card networks, the list of Amex accepting merchants is constantly growing, especially with small retailers and restaurants. In fact, last year alone over 70,000 new small business began accepting American Express*. American Express is bringing Cardmembers closer to the small businesses they already love and helping them discover new independent businesses in their communities with the Shop Small program. This is just one example of the value American Express brings to Cardmembers and small merchants. As the Shop Small program evolves, American Express will continue to connect Cardmembers to support small businesses. If you want to find small businesses in your neighbourhood that accept American Express visit American Express Maps. Find American Express Shop Small businesses here! This feature was sponsored by Amex Bank of Canada. The write up, views and opinions expressed in this feature, however, are purely those of Rewards Canada. *Based on internal comparison of American Express small business merchant locations in January 2017 to American Express merchant locations in December 2017. 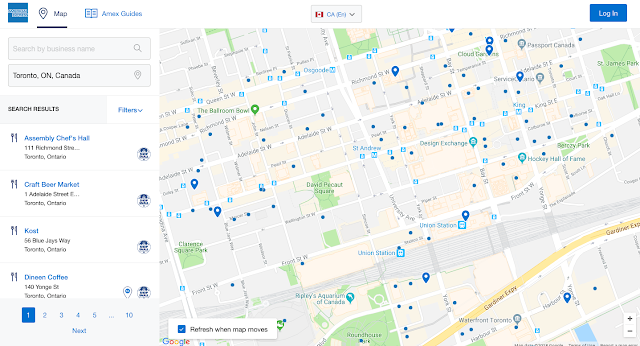 Have you ever used Amex's ShopSmall Map feature? What do you like about it most? Are there any improvements they can make? Tell us in the comments section below or join the conversation on Facebook and Twitter!